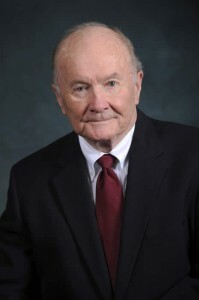 Jack received his Bachelor of Arts from Millsaps College with honors in 1954, where he was selected for membership in the leadership society, Omicron Delta Kappa. In 1954 and 1955 he attended Georgetown University and received his J.D. from the University of Mississippi School of Law in 1957. He was valedictorian of his graduating class and served as President of the Law School Student Body. He was also Associate Editor of the Mississippi Law Journal. Jack is also a 1998 graduate of Harvard Law School Program of Instruction for Lawyers, Mediation Training. Jack was admitted to practice in 1957. His area of practice is civil litigation and mediation/arbitration. Jack is a Fellow of the American College of Trial Lawyers and is rated A/V by Martindale-Hubbell. He is listed in all editions of The Best Lawyers in America, and has been published in For The Defense and the Mississippi Law Journal, both peer acceptance publications. He served as an Adjunct Professor of Law at the University of Mississippi School of Law from 1989 to 1991, teaching courses in civil procedure. Jack also served as President of the Mississippi Bar Association in l983-84, and is a member of the University of Mississippi School of Law Hall of Fame.